Students will test, evaluate, and improve models designed to remain slightly positively buoyant in 1 to 3 meters (3 to 10 feet) of water. As an alternative to using a water column built from soda bottles, you can use a 3 meter (10 foot) length of 10 cm (4 in) wide PVC, capped at the bottom. As students test in deeper water, they may need to increase the amount of foam used or decrease the amount of items they initially used for weight (such as coins) to maintain buoyancy under increasing pressure. They may also make adjustments to increase the amount of air in the design. Decrease your preparation time by enlisting students to help cut the bottles for the water column. Hand-held PVC pipe cutters can be used to cut PVC pipe to whatever length necessary. Consider pre-cutting the pipe into 5 cm (2 in) segments for students. For safety reasons, do not allow students to handle the pipe cutters. If you have access to an existing body of water at least 3 meters (10 feet) deep, such as a swimming pool, you can test the prototypes there instead of constructing the water column. Be sure to create submersion and retrieval tools that match the depth of the water. Increase students’ motivation by turning the trials at 3 meters (10 feet) into a competition. Award one point for each second that it takes a prototype to return to the surface. After all groups have completed their testing, offer prizes for the highest score and the most improved score. Keep safety in mind while testing with the water column. One person will need to be able to reach the top of the 3 meter (10 foot) water column in order to launch the prototype. Consider drafting an adult helper for this role. If possible, locate the water column near an outdoor stairwell or tall playground equipment, such as a slide. If necessary, use a ladder to reach the top of the water column, and the water column can be attached to the ladder for stability. Rather than using the tall water column for testing in 1 meter (3 feet) of water, you can use a smaller container, such as a large trash can. This could make it easier for students to get the prototypes into and out of the water and could allow multiple teams to test at once. Some groups might finish steps 3 or 4 early. Have these teams create a retrieval rod to rescue any prototypes that get stuck in the water column during testing. These rods must be able to retrieve a capsule from up to 3 meters (10 feet) of water. For example, students might bend a coat hanger into a hook and attach it to the end of a long piece of bamboo or ½-inch PVC pipe. 1. Activate students’ prior knowledge by having groups share their brainstorming ideas from Activity 3: Under Pressure: Creating a Model for adjustments they will make to keep their submersibles slightly positively buoyant at different depths. Have students bring out the Engineering Process handout from the previous activity and refer to it as they share their brainstorming notes. Have groups keep the handout handy. 2. View and discuss the "Charting the Course" video. Provide students with the following focus questions prior to viewing the video: What factors did James Cameron and his team consider when selecting their testing location? What made their choice of location unusual? What made it a good choice? Have students use these questions to take notes during the video, and use the questions to launch a discussion at the end of the video. 3. Review the testing procedure for deep-water tests. Explain to students that they will conduct a series of deeper-water tests on their prototypes at depths of 1 meter, 1.5 meters, and 3 meters (3 feet, 5 feet, and 10 feet). Distribute the Deep-Water Testing Rubric and review it with students to make sure they understand what is expected of them in this activity. Then, per step 6 of the Engineering Process handout, have students review the testing procedure and data table they used in the shallow-water tests in the Under Pressure: Creating a Model activity. 4. Have students adjust their prototypes in preparation for the deep-water testing. Give groups time to make adjustments to their models at this point based on their ideas from brainstorming in the Under Pressure: Creating a Model activity. Remind students to document any changes they make. 5. Have students test the prototypes in 1 meter (3 feet) of water. Give each group an opportunity to test their model three times at a water depth of 1 meter (3 feet) using the water column described in the How to Create a Water Column handout or an alternative container. Students should use a pole to submerge their prototype to a depth of 1 meter (3 feet) and then remove the pole to see what happens to the prototype. A negatively buoyant prototype will sink; a neutrally buoyant prototype will hover at 1 meter (3 feet), and a positively buoyant prototype will rise to the surface. The slower a positively buoyant prototype rises, the closer it is to neutrally buoyant. As students test their prototypes, have them record their data during each test, including the time it takes their prototypes to rise to the surface. Between tests, have students evaluate their results and determine any changes they want to make to their prototypes to improve their performance. Have students make any changes to their prototypes and record the details of those changes in their tables before testing again. 6. Have students test the prototypes in 1.5 meters (5 feet) of water. After students have completed the round of testing at 1 meter (3 feet), ask them to consider differences they encountered between testing at 1 meter (3 feet) and testing at 30 centimeters (1 foot) during the shallow-water test in the previous activity. Ask: What factors were different at the new depth? Did these factors significantly affect how the prototypes worked? How might these factors change at a depth of 1.5 meters (5 feet)? Have students repeat the testing process at a depth of 1.5 meters (5 feet) using the water column. Again, make sure they record detailed data for each of the three tests, including any adjustments made to their designs. 7. Have students test the prototypes in 3 meters (10 feet) of water. Explain that students will have three opportunities to test and adjust their models at the target depth of 3 meters (10 feet). Their third test at this depth will be their final test. Have students review their testing data from the previous tests and consider what factors will be different in 3 meters (10 feet) of water from factors in 30 centimeters (1 foot), 1 meter (3 feet), and 1.5 meters (5 feet) of water. For example, a prototype that is positively buoyant at 1.5 meters (5 feet) might or might not remain positively buoyant at 3 meters (10 feet) due to compression of foam pieces from the increased pressure. Have students list these factors, along with how they might affect the functioning of the prototypes. Have students make and record any adjustments to their prototypes to address these factors before beginning the final set of tests. Have students repeat the testing process at a depth of 3 meters (10 feet) using the water column. Again, make sure they record detailed data for each test, including any adjustments made to their designs. Have students note their best time for this set of tests. The best time would be the slowest time for the prototype to rise to the surface from a depth of 3 meters (10 feet). 8. Have students write detailed deep-water testing reports. Have students use their data from testing to document changes they made to their prototypes during the testing process and to explain why those changes were necessary. Have students use numerical data, such as the time it took the prototype to rise to the surface, to describe the changing conditions they encountered and the adjustments they made and why. Have them describe the effects of pressure on their models and how they dealt with those effects. 9. Have students revise their original concept drawings based on the testing process. Have groups return to their original concept drawings from the Under Pressure: Defining the Problem activity. Ask: Is there anything you would change about your original concept based on the testing you conducted on your prototype? Have students revise their concept drawings to make any adjustments based on the testing they have done. 10. Discuss the process of modeling, testing, and revising. Give each group a chance to brief the class on their testing results. As a class discuss the overall testing process. Talk about what worked well and what didn’t work as well. Discuss the following points: What adjustments did groups make, and why were these adjustments necessary? How did the necessary adjustments differ among groups? What factors might have caused these differences? 11. Explore the DEEPSEA CHALLENGE team’s design process and solution. 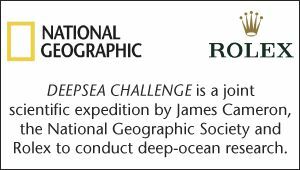 Have students read about and discuss the solution James Cameron and his team came up with to solve the problem with the foam on the provided DEEPSEA CHALLENGE: Systems and Technology website. View and discuss the "Contingency Plans" and "Systems Failure" videos. Provide students with the following focus questions prior to viewing the videos: What went wrong during the final dive? How did these issues affect the plans for the dive? What adjustments did the team make to address the problem? Have students use these questions to guide their note taking for each video. Then use the focus questions to open a discussion about the videos. Ask: Are you surprised that the DEEPSEA CHALLENGE team encountered these problems after spending so much time and money to design and test the submersible prior to the final dive? How does this reflect the nature of engineering challenges? As a class, discuss any similarities between students’ engineering experiences in this activity and the expedition team’s engineering process and experience. Use the Deep-Water Testing Rubric to assess students’ testing reports. Have groups exchange submersible models. Challenge each group to adapt the model they receive to remain neutrally buoyant in 30 centimeters (1 foot) of water. Discuss why this is more challenging than adjusting the model to be positively or negatively buoyant. Principle 7a: The ocean is the last and largest unexplored place on Earth—less than 5% of it has been explored. This is the great frontier for the next generation’s explorers and researchers, where they will find great opportunities for inquiry and investigation. Principle 7d: New technologies, sensors and tools are expanding our ability to explore the ocean. Ocean scientists are relying more and more on satellites, drifters, buoys, subsea observatories and unmanned submersibles. You will need to build a water column (described in the How to Build a Water Column handout) before beginning the activity. Allow three to four days to build the column and let it dry before use. The testing phase of the activity should be completed outside. The water column will need to be placed so that the top of it, which will be 3 meters (10 feet) above the ground, is easily accessible. An outside stairwell, playground equipment, or a ladder could be used to access the top of the column. Keep safety in mind when placing and using the water column and be sure it is secure and that the method you use for students to access the top of it is safe. Your testing location should also include a safe place to drain the water from the column at the conclusion of the activity. See Modifications for other ways to test the prototypes if you do not have time to build the water column described. This activity is best done in two sessions. Complete steps 1 through 6 in the first session, and complete the rest of the steps in the second session. 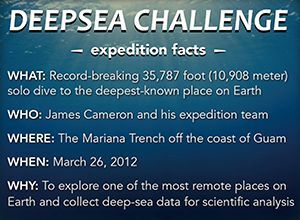 James Cameron and the DEEPSEA CHALLENGE team faced a number of design challenges as they were engineering the DEEPSEA CHALLENGER submersible for Cameron’s historic 2012 solo dive to the bottom of the Mariana Trench. One of these challenges was designing a material that was strong and light, and that could maintain its shape under the enormous pressure nearly 11 kilometers (7 miles) down in the ocean. The team devised a syntactic foam made of tiny spheres of hollow glass suspended in a resin. The foam they designed was so light and strong and held up so well under pressure that the team was able to use it as the main body of the submersible. Many ordinary foams, such as Styrofoam, also contain large amounts of air, but they are highly compressible under pressure. For example, Styrofoam is made up of tiny pellets of a synthetic material and is almost 90% air. Under high pressure, air is forced out of the foam, compressing it. Compressed foam can be less buoyant than foam in its normal, uncompressed state. Buoyancy is the upward force exerted by a fluid on an object, equal to the weight of the fluid displaced by the object. (Note that both liquids and gases are considered fluids.) Buoyancy works to make objects float because the pressure at the bottom of the object, which is deeper in the fluid, is greater than the pressure at the top of the object. This creates a net upward force. When an object is placed into a fluid, it displaces a volume of fluid equal to the volume of the part of the object immersed in the fluid. As an object is lowered into a fluid, the volume of the part of the object immersed in the fluid increases, and so does the amount of fluid being displaced. The weight of the fluid being displaced is equal to the buoyant force. The buoyant force reaches a maximum when the object is completely submerged, that is, when the object is displacing a volume of fluid equal to the object’s entire volume. If the buoyant force is less than the weight of the object, the object is negatively buoyant and will sink. If the buoyant force is equal to the object’s weight, the object is neutrally buoyant and will “hover” under the surface without sinking or moving upward. If the buoyant force is greater than the weight of the object, the object is positively buoyant and will accelerate upward in the fluid. It is not necessary to calculate the maximum buoyant force to determine if an object will float. Simply compare the density (mass/volume) of the object to the density of the fluid. The net force acting on an object placed in a fluid depends on the relative weight of equal volumes of the object and the fluid. With equal volumes, greater density means greater weight. When the density of an object is greater than that of the fluid, it is negatively buoyant in that fluid. When the density of the object is less than that of the fluid, the object is positively buoyant. When the density of the object is the same as that of the fluid, it is neutrally buoyant. In the deep ocean, pressure can also affect buoyancy by compressing materials. This will make those materials more dense (the same mass but a smaller volume), and thus less buoyant. The DEEPSEA CHALLENGER was designed with syntactic foam because the foam is light, strong, and not as compressible as other types of foam. This helped keep the DEEPSEA CHALLENGER light and minimized the effects of pressure on the vehicle’s buoyancy. the power to float or rise in a fluid. material consisting of tiny hollow "microballoons" made from material such as glass or carbon.